Reprint. Originally published: London: Harvill Secker, 2017. The twisting new thriller from international sensation Ruth Ware, author of Sunday Times bestsellers In a Dark, Dark Wood and The Woman in Cabin 10`Another heart-stopping belter of a thriller from an epic talent' HeatThe text message arrives in the small hours of the morning: I need you. Isa drops everything, takes her baby daughter and heads straight to Salten. She spent the most significant days of her life at boarding school on the marshes there, days which still cast their shadow over her. 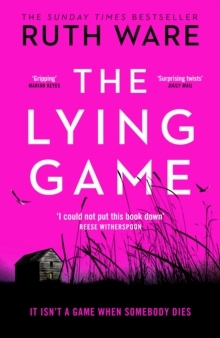 Isa and her three best friends used to play the Lying Game, competing to convince people of outrageous stories. Now, after seventeen years of hiding the truth, something terrible has been found on the beach. The friends' darkest secret is about to come to light... `I could not put this book down' REESE WITHERSPOON`Atmospheric, mysterious, gripping' MARIAN KEYESNow available for pre-order: Ruth Ware's brand new psychological thriller, The Death of Mrs Westaway.